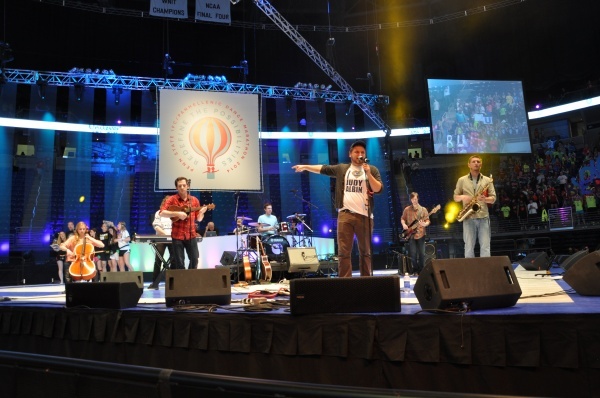 THON’s first band to perform this weekend was none other than Lenina Crowne, the indie rock legends of State College. They played a great mix of popular covers and high energy originals. Their cover of “Jumper” by Third Eye Blind had the entire BJC screaming every word, as well as with their final song, “Hey Jude”. The band consists of 7 members, including guitarists, a bassist, a drummer, saxophone player, cello player, and a lead singer that jumps from guitar to harmonica during their version of “Piano Man” by Billy Joel. Their covers are the perfect just what the crowd needs and wants, but their originals, such as “Mood”, are the perfect combination of crazy and cool, so regardless of knowing the words or not, the crowd still goes wild! Lenina Crowne’s unique sound and high energy were perfect for the start of THON 2014, and after a performance like that, the bands for the rest of the weekend have quite the task ahead of them.